Triple your gift, triple your impact… at no additional cost. First and foremost, giving back comes from the heart. Many philanthropists do not always consider tax savings when it comes to their donations. The Foundation seeks to change that. Our clients are among the most successful and generous people in society. Most want to know – what is the best and most efficient way to give? The answer to that question is through public flow through shares with a liquidity provider. 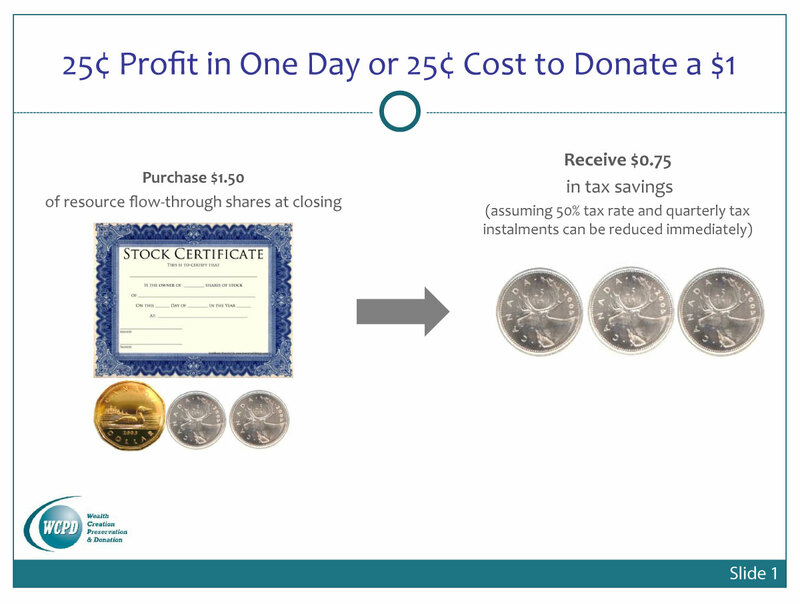 Using our proven and efficient flow through share model, The Foundation can typically triple donations, and triple your impact, at no additional cost. We have facilitated significantly more flow through transactions than any firm in Canada and assisted in north of $100 million in donations to charities across the country. Since 1954, Canada Revenue Agency (CRA) has offered a 100% tax deduction on flow through shares, which are stock issued by junior mining (and oil/gas) companies in Canada to fund drilling and exploration. The government offers this tax incentive due to the mining industry’s important role in employment and economic development, along with the substantial tax revenue should the company make a discovery. According to a 2017 World Bank Report, mining is also essential to the future of renewable energy, through the much-needed supply of metals and raw materials. 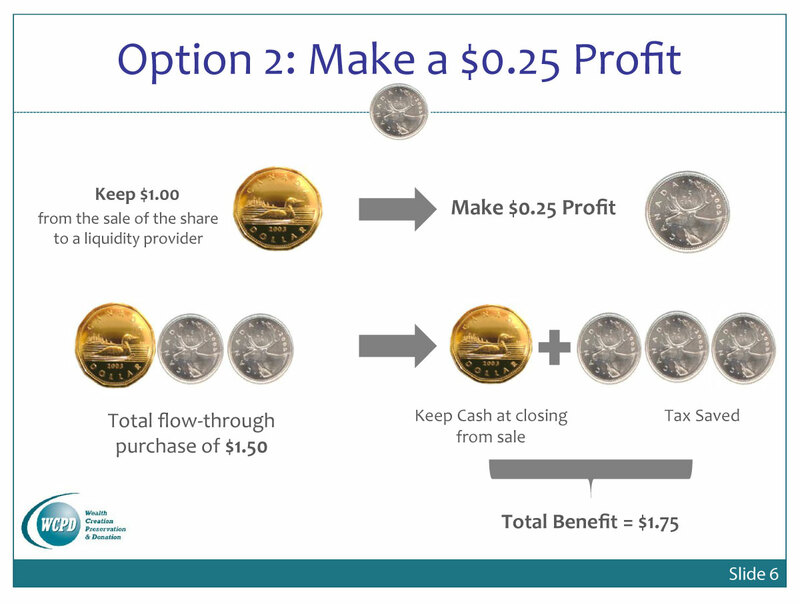 To unlock the tax benefits, clients purchase these public flow through shares and then immediately sell them at a discount to an institutional buyer, or liquidity provider, for cash. 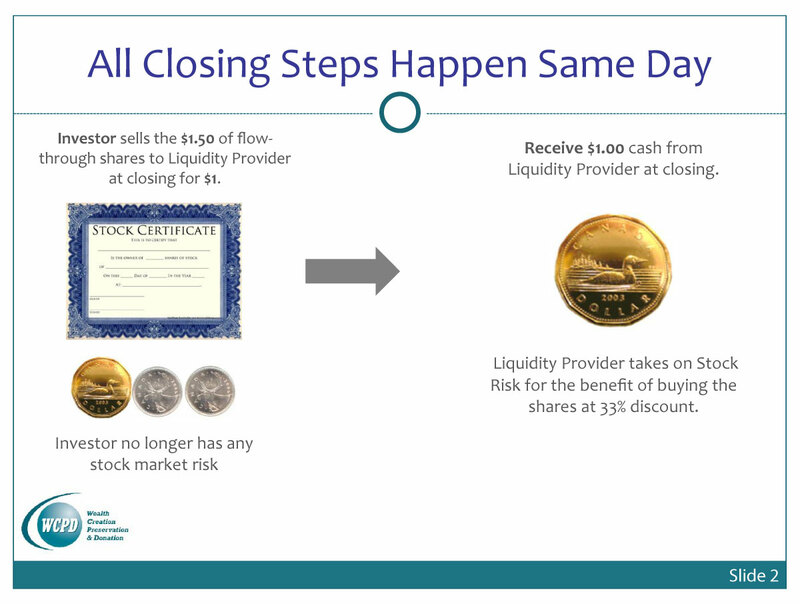 This liquidity provider takes on the stock market risk, not our donors – this is a key benefit. The donors give the cash proceeds of the sale to the charities of their choice and receive another 100% tax deduction for this donation. By combining these two taxes policies, our clients can reduce their taxes while giving more to a cause that touches their hearts. The Foundation takes care of the entire process for you, from beginning to end. Some of The Foundation’s clients have their own private foundations to distribute funds. For the convenience of our clients, we also offer the public WCPD Foundation, a registered donor-advised foundation that efficiently disburses cash donations from the cash proceeds of the flow through sale. 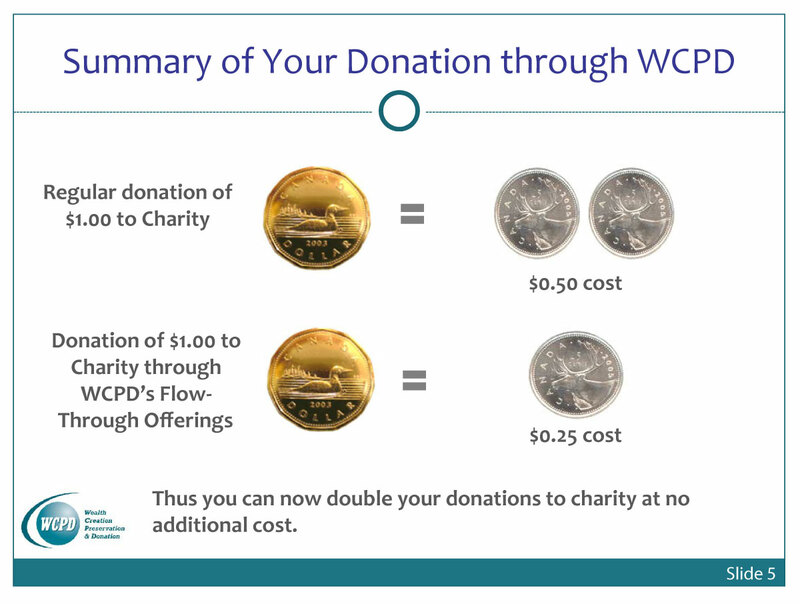 Once the cash arrives in the WCPD Foundation, there is no fee or deadline to allocate your charitable donations. Clients can even assign his or her foundation a unique name, such as the Johnson Family Foundation, for example, which would then rest under the umbrella of the WCPD Foundation. Buy flow-through shares issued by a Canadian mining company. Every dollar invested in these shares is 100% tax deductible. 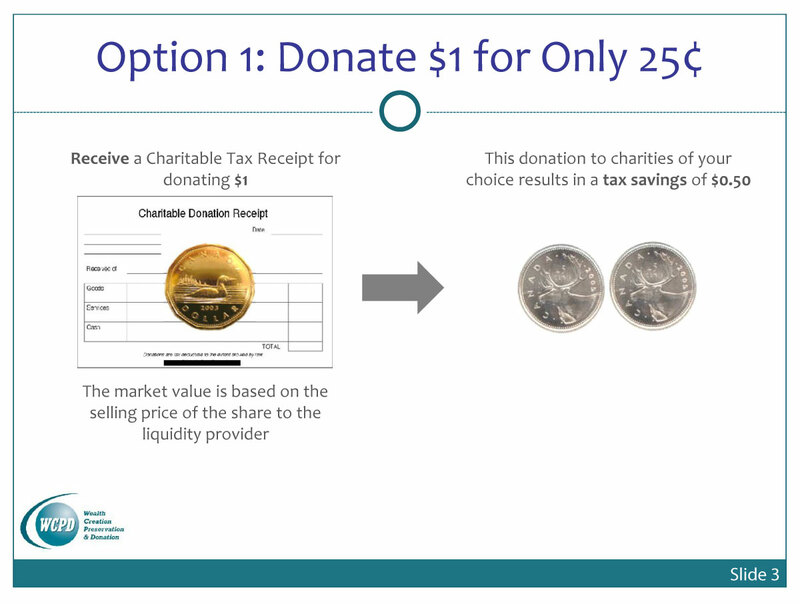 This step eliminates any stock market risk to the donor. Donate the cash proceeds to your favourite charity. Receive a charitable tax receipt based on the cash value. 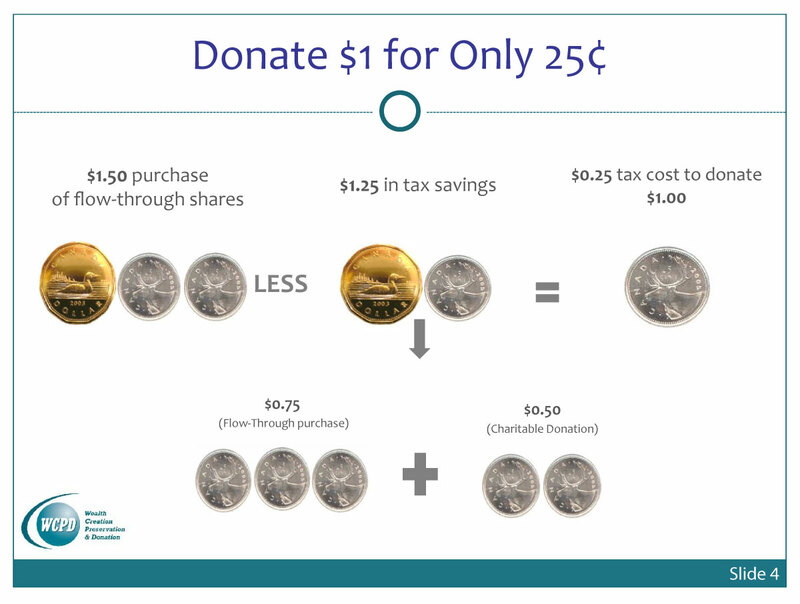 By combining two tax policies (flow-through shares & donations), the Foundation (WCPD) can help reduce your taxes and allow you to give more. Wealth Creation Preservation & Donation Inc.‘s financial planning strategies help increase your personal wealth by tailoring financial solutions that fit your personal circumstances. Our highly personalized boutique services differ from the cookie-cutter solutions offered by large financial institutions. We reject the standard industry approach that is driven by selling products and advice based on sales targets and product launches. At WCPD Inc. the onus is never on our clients to initiate discussions. We are always working to anticipate client needs and tailor the right solutions. WCPD Inc. also offers access to some of Canada’s most exciting opportunities in the resources sector. Our other financial services include investment and insurance services. Our first meeting is always complementary with absolutely no obligation. WCPD Inc. provides an insurance analysis to determine the correct life, disability or business insurance required for your situation. As independent brokers, we can offer the best advice on companies to meet your insurance needs. WCPD Inc. monitors and provides access to the world’s best money managers and index funds. An initial interview with you will help us build a personal portfolio that will meet your financial goals and risk tolerance. WCPD Inc. not only offers regular tax savings vehicles such as investments in flow-through shares, but also analyzes other tax reduction strategies being offered by the market. WCPD Inc. looks very carefully at tax reduction structures designed by the top tax lawyers in Canada and recommends those that fit our clients’ situations. WCPD Inc. complements our clients’ existing relationships with their accountants. We are pleased to have worked with over 80 accountants to help reduce our clients’ taxes. WCPD Inc. ‘s Philanthropic Investment guarantees the best after-tax return on a philanthropist’s donation. Flow-through shares, with a liquidity provider, are the most effective tax-assisted investment that a Canadian in the top tax bracket can make. The investment is tailored to the needs of altruistic high-net-worth individuals and corporations, and can be applied to a donation to any registered charity, public or private foundation. Flow-through shares have been in the tax code since the 1950s. Please contact us for real-life examples that will help shed light on your unique situation.